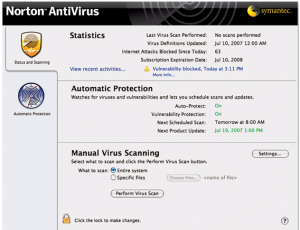 While choosing antivirus, how we can forget one of the leading antivirus manufacturer Norton. So, let’s see what has Norton has bought for us with its latest offering which is dubbed as Norton Antivirus 11 for Mac. Norton has integrated two most important aspects of antivirus, antivirus and also an internet worm protection. 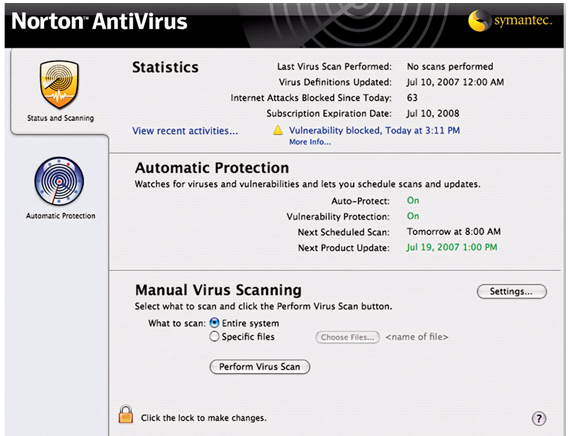 Being an old provider of antivirus, Norton has big virus definitions lists which are more than enough to keep various types of viruses at bay. Also, most importantly it’s one of the most trusted brand’s of antivirus provider and also comes with the award winning and propreitery Live support option with which you can solve the query if any very easily. So, let’s have a look at the list of features which Norton Antivirus for Mac 11 has in store for us. Automatically detects and removes viruses—You don’t need to scan manually for digging the virus out from your system as this one offers automatic protection against the latest threats with set-and-forget convenience. Scans and cleans downloaded files—This one not only provides continuous and up-to-date protection via fast updates but also cleans the downloaded files and email attachments. Protects against attacks—No need to think about the attackers, as Norton provides advanced protection against software and all Internet vulnerabilities. Right from the IM to the file sharing protection, this antivirus suite has it all. Also, with additional tools like PC security and PC tuneup, your PC security experience will never be the same again. The only sad part about this antivirus package is that you need to renew this every year and cost 50$ per year. This antivirus supports Mac 10.4 version or higher. There are also other antivirus providers for Mac, like ClamXav which is free to use antivirus software, Virus barrier etc.